Firefighting Amphibians | Aircraft | ShinMaywa Industries, Ltd. In Europe and North America, firefighting amphibians are in active service in the fight against forest and urban fires. Because of concerns about urban fires in the wake of a major earthquake, the US-2 is expected to serve as a firefighting amphibian in Japan as well. With modifications, the US-2 can carry 15 t of firefighting water and fire extinguishers, which is equivalent to the amount that about 21 ordinary firefighting helicopters can carry. The STOL aircraft can drop water with pinpoint accuracy on the area where a fire has spread. By taxiing on the surface of the water (ocean, etc.) for approx. 20 seconds, the 15 tons water tank can be filled up. 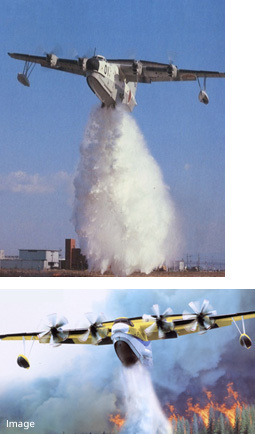 In case of a major fire, the US-2 can scoop up water to repeatedly extinguish fires. The effects of aerial firefighting were verified in an experiment using a modified model of the anti-submarine patrol plane PS-1 in 1976. Firefighting experiment. Water volume and pressure may be adjusted by opening / closing the doors. 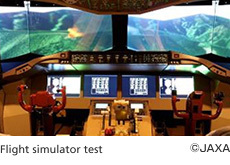 ShinMaywa collaborates with the Japan Aerospace Exploration Agency (JAXA) and Japan Aircraft Development Corporation (JADC) for joint research.